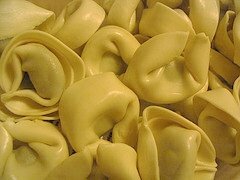 Learn how to make homemade tortellini from scratch. Basic pasta dough recipe is easy to work with. Try one of my Italian recipes today. Offering homemade appetizers, desserts and more - see navigation bar on the left. Divide the pasta dough into 2 or 3 parts and roll out as thinly as possible into sheets. Cut into 1-1/2 inch circles. Place 1/4 teaspoon of filling in each circle and fold over to form a half-circle. Seal the edges. Hold the folded side of the dough over the top of your index finger and stretch the two points of dough around it to form a small crown. Pinch ends together at the bottom of your index finger. Cook in 6 or 8 quarts of boiling salted water for 6 minutes and serve with your favorite sauce. You can also cook these in beef or chicken broth.